Generators can provide comfort, safety and security during power outages. They can be either installed permanently or used temporarily. In both cases, you must install the generator properly to protect electrical workers, your family and your property. Your risk damaging your generator. Electrical workers use a grounding system to protect themselves. This system will damage an improperly installed generator. Also, when power is restored to the electrical system, it will feed into your home or business and burn out your generator. Carefully read your generator’s instructions. The use of a generator may require a permit and inspections. Contact us at (253) 502-8277 for more information. Follow these safety considerations to operate your portable generator safely. These tips are not a replacement for reading the manufacturer’s instructions, which are written specifically for your generator. Never run electrical cords under rugs where heat might build up or damaged cords may go unnoticed. Keep cords out of the way so they don’t present a tripping hazard, especially in dimly lit doorways. Do not operate a generator with a faulty ground fault circuit interrupter (GFCI). You risk electric shock. Be sure that the total electricity power load on your generator does not exceed the manufacturer’s rated load. Do not operate your portable generator indoors. Exhaust gas contains poisonous carbon monoxide. Provide adequate ventilation during generator operation. Keep your generator dry. 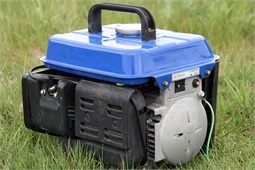 Operating the generator near water can lead to serious injury or death. Keep the generator away from buildings and other equipment during operation. Do not enclose the generator in any structure. Operate your generator on a firm, level surface. Keep flammable materials away from the generator. Add fuel to your generator in a well-ventilated area. Do not smoke or allow flames or sparks where the generator is refueled or where fuel is stored. Fuel vapors are flammable and may ignite after the engine is started. Be sure to clean up any spilled fuel before you start the generator. Check for fuel leaks before, during and after operation. Read your owner’s manual! Generators are capable of providing enough electrical power to cause a serious injury or death if misused. Make sure all safety labels that come with your generator stay permanently affixed to the generator. Know how to stop the generator quickly in an emergency. Make sure other adults in the household know how to stop the generator quickly. The muffler becomes hot during operation and may remain hot for a while after shutdown. Test the GFCI before each use. If the test fails, do not use your generator; see your generator dealer instead.